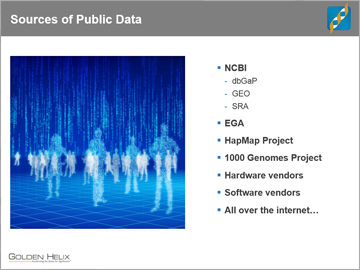 Rich repositories of genomic data are readily available in online public databases such as dbGAP, 1000 Genomes, International HapMap Consortium, Gene Expression Ombibus (GEO), and Sequence Read Archive (SRA). But what can you expect when you download one of these datasets and what can that data be used for? In this webcast, Dr. Christensen will cover: options for getting GWAS and sequence information online without any associated cost, tips for working with these datasets and what you'll see in terms of data quality and usefulness, how to use public data sources in conjunction with your GWAS or sequence study (and how NOT to), and data management and manipulation features in SNP & Variation Suite to more effectively utilize online databases.